Car Body Repairs 4 Less repair most types of rust on Vehicles from door rust, wheel arch rust and stone chip rust. Repairing rust is not an exact science and there is no 100% guarantee that the rust will not come back. What Car Body Repairs 4 Less offer is that the rust refurbishment that is carried out will be guaranted for 2 years and that the rust will not reappear within 2 years. If the rust is too severe on inspection we will not attempt the job. The time to carry out the process of rust spot removal varys form 2 - 3 hours (depending on weather conditions). This rust damage on the lower front door was on a 2014 year old Citroen in Bishops Stortford. It’s a relatively new car to have rust on; you don’t get many cars that are younger than 4 years showing signs of rust. 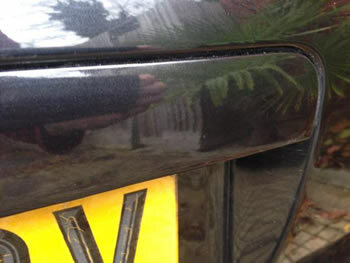 The oxidisation was removed and treated followed by a lower panel respray . The job was completed outside the customer’s house and in less than 3 hours. This rust is on the rear tailgate trim. Its a common fault with Audi, Volkswagen and Seat. 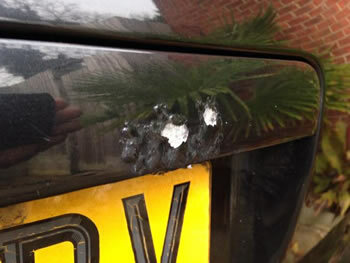 The rust came through within weeks of this customer chipping the damaged section. It didnt take long for the paint to start flaking and peel. We fixed the damage within a couple of hours. Rust before The damage as you can see is quite severe and is located around the rear wheel arch. Rust After The rust has been completely removed and took 2 hours to fully complete. Rust Spot on BMW The rust is on a small area located on the rear wheel arch near a slight dent.Rust Removal The rust has been completely removed and took 2 hours to fix. Rust Damage on BMW The danage is located on the rear wing above the bumper.Rust Removal on BMW After removing the rust a hole was left that had to be patched and repaired.